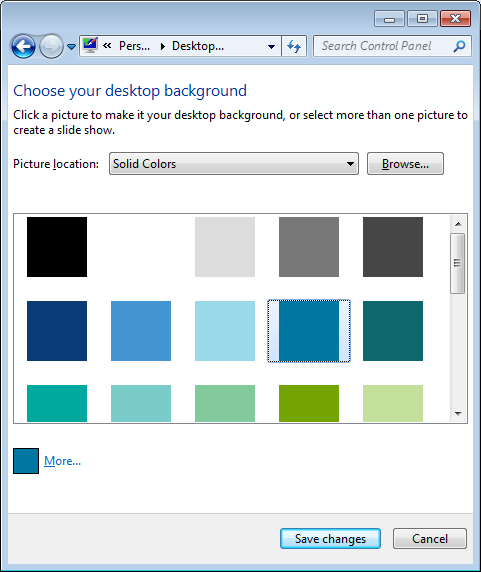 3 – Click on Change desktop background under the Appearance and Personalization section. The Picture Location section allows you to choose from different types of image files and solid colours that you can use for your desktop background. The available options are – Windows Desktop Backgrounds, Picture Library, Top Rated Photos, and Solid Colours. The Browse… button allows you to choose a folder on your PC that contains other picture files. You can then select from those pictures files and use them as your new desktop background. Once you have made the changes and chosen your new desired background, click on the Save changes button to save your new settings.